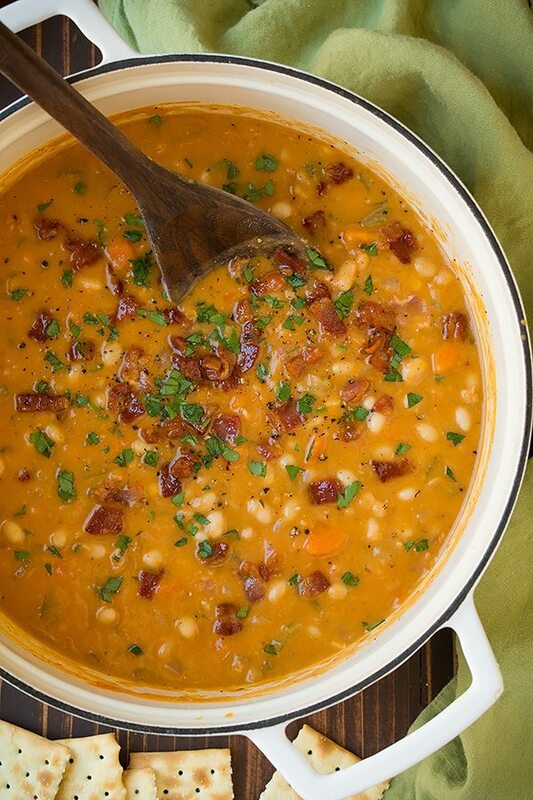 Warm and hearty Bean and Bacon Soup to brighten up those chilly days! It’s made with simple ingredients and it’s way better than canned! Plus it doesn’t have any mysterious ingredients, you can name everything here. There aren’t many canned soups out there that I’ll buy but the one that I’ve always bought is Campbell’s Bean and Bacon Soup. My mom bought it so I grew up eating it and therefor it’s one of those foods I just crave (that and a pack of ramen noodles). 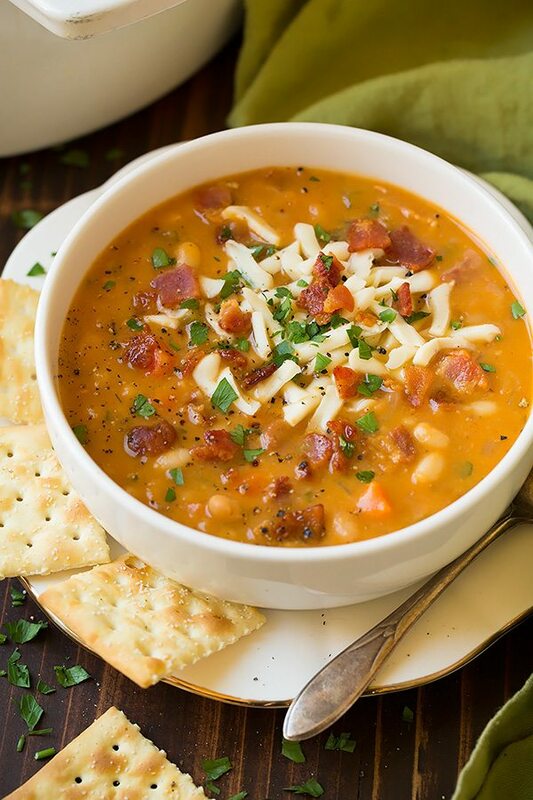 Well I finally decided it was due time to try making it a home and I’m so glad I finally did because of course this homemade Bean and Bacon Soup is so much better then the canned stuff! 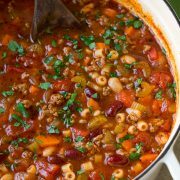 It’s so easy to make, it’s incredibly hearty and filling and it has such a delicious flavor! 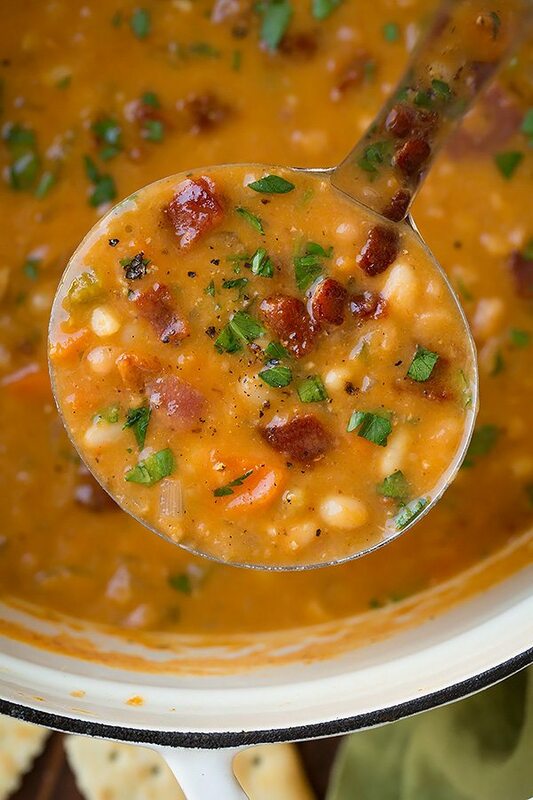 One thing I really love about this soup is that it uses ingredients I always have on hand. 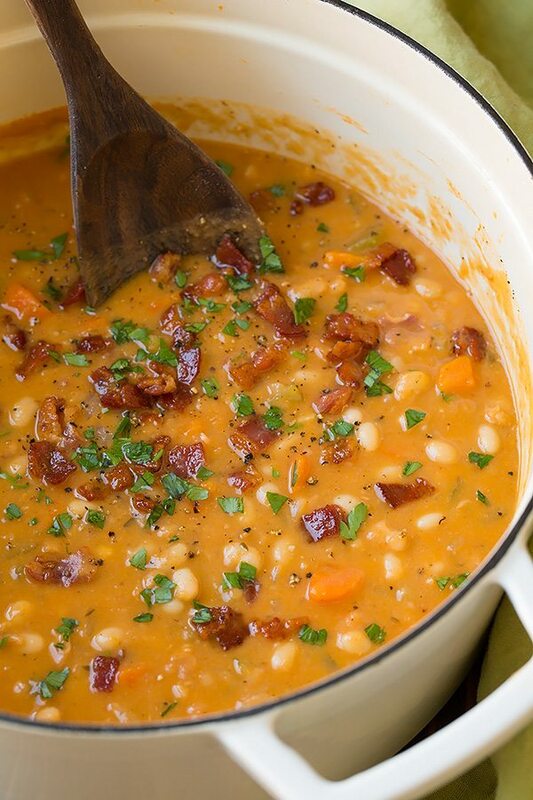 I keep bacon in the freezer and those basic veggies – carrots, celery, onions and garlic are staples, and canned beans are a pantry must so I’m sure this will be a go to soup for me this upcoming fall and winter. Oh and let’s not forget the string cheese. It may likely be the first time you’ve seen a soup recipe that lists string cheese as an ingredient but don’t knock it until you try it. My sister got me hooked on it with the canned stuff (as well as adding a fair amount of pepper) and now I think it’s a must! Mozzarella works fine too though if that’s what you keep on hand. Either way try it soon and don’t leave off the cheese! 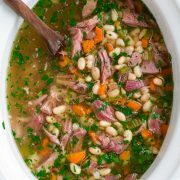 Warm and hearty Bean and Bacon Soup to brighten up those chilly days! It's made with simple ingredients and it's way better than canned! Plus it doesn't have any mysterious ingredients, you can name everything here. Cook bacon in a large enameled cast iron pot until browned and crisp, transfer bacon to a plate lined with paper towels, while leaving 2 Tbsp rendered bacon drippings in pan. Heat drippings over medium-high heat and add onions, carrots and celery. Saute 4 minutes then add garlic and saute 2 minutes longer. Add in chicken broth, tomato paste, sugar, thyme and beans. Stir in 3/4 of the cooked bacon, while reserving remainder in a small resealable bag in refrigerator until ready to use. Season soup with salt and pepper to taste. 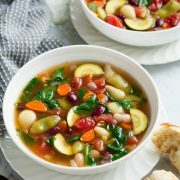 Bring to a boil then reduce heat to low and allow to simmer, stirring occasionally, until veggies are soft, about 30 minutes. Transfer 2 1/2 cups of the soup to a blender, cover with lid (while removing lids center insert and holding a folded kitchen towel over blender) blend until smooth. Stir pureed mixture back into soup. Serve warm topped with shredded cheese and parsley. Thin soup with more broth or water if desired.